Welcome to OSD Schoology Parent Access! Below you will find an explanation of the different areas of your Schoology account. This guide is intended to help you learn how to navigate around Schoology. For more in-depth guidance on specific Schoology features, check out the Help Center at support.schoology.com. You can find the online Parents Guide here. What Is Schoology? OSD teachers may choose to use Schoology to post their classroom materials online; provide a safe forum for students to discuss their ideas and collaborate on projects; and to assign and collect homework electronically. It helps students stay organized and it keeps the class connected. Your child already has login credentials through our district student portal. Parent accounts have also been created using the email address you provided in Skyward. Begin at the Schoology password reset page. Enter your email address and select "Send my Login Info." A link will be sent to your email address to change your password and enter your account. The first time you log into Schoology, you may want to set up some of your account settings to make sure you get the most out of Schoology. Parent accounts on Schoology are really like have two accounts in one. One is your own personal account, with your own name and information. This is connected to your child’s account, in which you can view updates about his or her activity. Start by clicking on the arrow in the upper-right corner, next to your name, and then select your child’s name to switch into his or her account. The checkmark in this dropdown menu indicates which account you are currently in. Set up your Notifications to control how Schoology contacts you about your child’s school activities. To set up notifications, select Settings from the dropdown menu in the upper right hand corner. Then select Notifications and turn on or off notifications for each activity type. If you have connected a smartphone to your account, you may adjust notifications for your device here also. The Schoology Parent Email Digest is a brief summary of your child’s activities delivered to your inbox. Here, you can opt to receive it on a daily or weekly basis. A Parent Email Digest contains information such as courses your child is enrolled in and overdue and upcoming assignments. To set up the digest, first select the child in the upper right. Then select Settings, then Notifications. 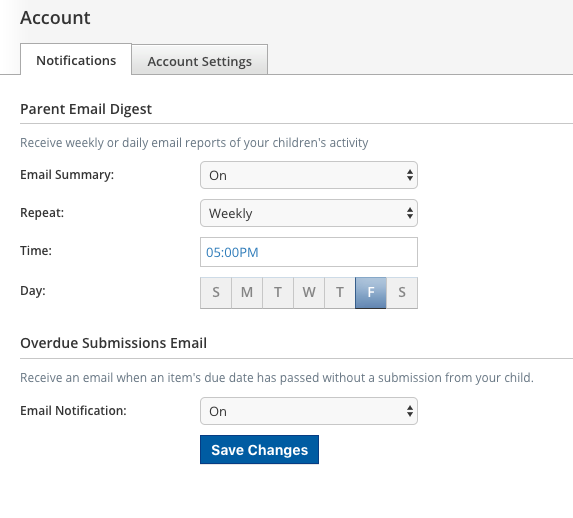 Once you have configured your Parent Email Digest and Overdue Submissions Email settings, click Save Changes. The Account Settings page is where you can do things like change your password or update your email address. You can also determine your landing page when you login to Schoology. To go to the Account Settings page, click the arrow in the upper-right corner again and select Settings from the menu. Scroll down to Set Default Account. This determines the first page you see when you log in to your Schoology account. You can toggle into your child’s account at any time, to stay updated on his or her schoolwork and activity. Select Main Account if you would like to see your own personal account when you log in. Select Child’s Account if you want to automatically start in your child’s account when you log in. After logging in, you can see the top navigation bar from anywhere in Schoology. On the left side of the bar, you can navigate to the four main areas of Schoology: Home (OSD Icon), Courses, Groups, and Resources. Clicking Home always brings you back to your home page, the landing page you see when you log in. This is where you see your Recent Activity feed. When you are in your own Schoology account (not your child’s), icons for calendar and notifications display in the top navigation bar, on the right. You can also click your name to go to your own Personal Profile. Click on the arrow in the upper-right corner of your account and select your child’s name to view his or her activity. Select Home (OSD icon) to see your child’s recent activity in all courses and groups and any updates from the course or group administrators. Select Courses to see a list of your child’s current courses. Click on an individual course to see materials, assignments, tests, and discussions from that course. Select Groups to see a list of your child’s Schoology Groups. Groups can be used for a variety of activities, from school projects to extracurricular teams and clubs. The Upcoming section displays a list of your child’s upcoming assignments and events. The Calendar icon shows all assignment and event dates for your child’s courses and groups.